Robert Otto : Ambient Nights. Ambient electronic and neoclassical soundscapes. Ethereal ambient drifts, atmospheric drones, synthesizer pads and strings, accompanied by roaming electric piano themes combine to take you on an Ambient Electronic Space Music journey through the night under a canopy of stars from sunset to sunrise. Played in order, the album tracks feature shifting and evolving themes as sunset fades into lingering twilight, the constellations, aurora and planets appear, and eventually the zodiacal light anticipates the coming dawn and sunrise. 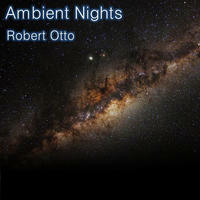 License Ambient electronic and neoclassical soundscapes by Robert Otto for your project. Play the music of Robert Otto in your restaurant or store.